Once a file has been uploaded, you will want to ensure it is properly scaled. Click & Drag a line along a known length of the floorplan, such as a door or a wall (a standard door will measure 3'). Remember to click Save to save your changes! You can also Crop your uploaded file, when necessary. To upload a floorplan from within a Diagram Event, add a new Room to an Event, from the Rooms section of the left panel. Select the New Room (+) button to open the Rooms window. Finally, choose to Save to This Event or Save to Account Library. Click, hold & draw out a line segment along a known dimension of the diagram, such as a door or a wall. Hold down the Shift key to lock the scale line into the four cardinal directions. Specify the actual length of the line, and then select Scale. As long as the file itself was originally to-scale, the diagram will be to-scale in Social Tables as well! Once a floorplan has been scaled from within a Diagram event, that scale will be saved and apply to the floorplan when it is added from the Venue Library into future events. Uploading and scaling an image from Google Maps or Google Earth is fun and easy. Follow the previously outlined steps and you'll be on the road to success in no time. 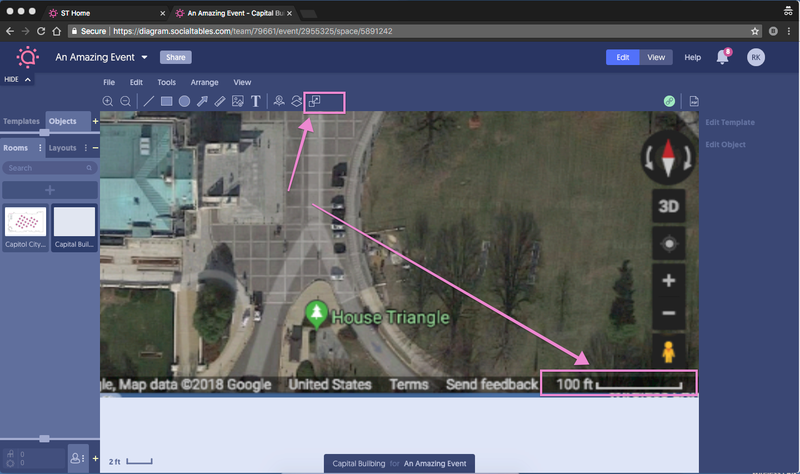 Remember to use the scale bar in the bottom right corner of the Google Maps image for the most accurate scaling experience. Want to see more? Click here to view a short video tutorial on uploading a floorplan! If you're looking for a guide to uploading a PDF in the legacy version of Social Tables, click here.